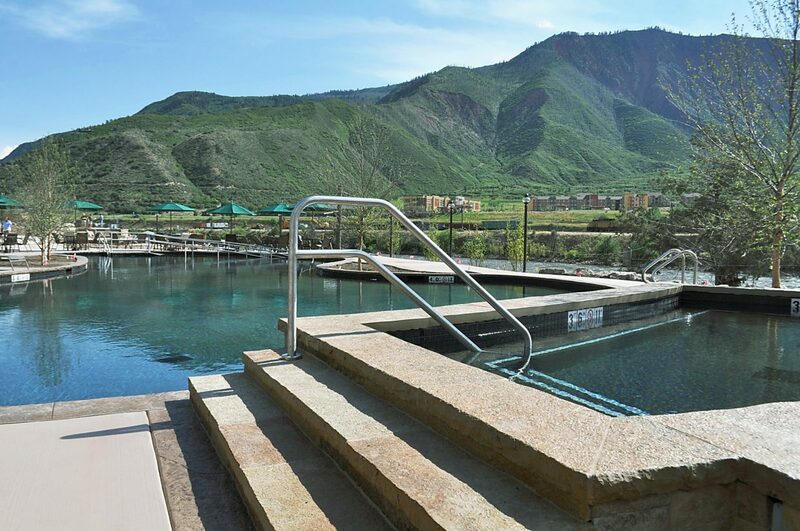 This shows the whirlpool and family pool at the new Iron Mountain Hot Springs in Glenwood Springs. Iron Mountain Hot Springs will be open from 9 a.m. to 10 p.m. through Labor Day weekend, and then off-season hours will begin. Admission is $25 per adult, $15 for kids 3 to 12, and free for children younger than 3. An evening soak from 8-10 p.m. is available for $15 for adults and $9 for kids. Discounts are available for those 65 and older, AAA members and military. Re-entry is not included with admission. Off-season passes will be available for locals after Labor Day, with prices to be determined. Capacity will be maintained to make sure that the pools do not become overcrowded. Guests can check availability at www.IronMountainHotSprings.com. A pop-up screen will notify visitors when capacity has been reached, and they can check back regularly from mobile devices to find out when space becomes available. Iron Mountain Hot Springs, Glenwood Springs’ second hot springs pool, will open Saturday after a wet spring slowed construction. A grand opening will be held later this summer. Iron Mountain Hot Springs, between the Colorado River and Interstate 70 west of Two Rivers Park, will offer 16 mineral hot springs soaking pools and a freshwater family pool with a jetted spa. The family pool is filled with 86,000 gallons of fresh water heated to 90 degrees Fahrenheit by the geothermal exchange. A smaller, elevated whirlpool spa will have a soaking temperature of just over 92 degrees, enabling parents to enjoy the warmer water while supervising their children below. Sixteen smaller pools are filled with thermal mineral waters that range from 98 to 108 degrees. A quiet zone surrounds the area; children ages 5 to 14 must be accompanied by an adult, and those younger than 5 are not allowed. The views, which vary from pool to pool, include the Colorado River as it winds through the valley, Iron Mountain, Red Mountain, the Flat Tops and Mount Sopris to the south. Several springs emerge onto the Iron Mountain Hot Springs property with average water temperatures ranging from 105 to 108°F. At least 14 minerals are found in the analysis of the water; the five most abundant are iron, sulfate, chloride, sodium and calcium. Iron and sulfate are touted as having relaxing qualities. Thermal heat from the springs is also used to warm the pools and to heat the walkways and buildings. Beckley told the Post Independent’s John Stroud that developing the hot springs did require a deal with the fabled Hot Springs Pool just upstream for the rights to use some of the spring water that also serves to feed the big pool. The history of the Iron Mountain Hot Springs property dates back to 1896, when the West Glenwood Health Spa opened. Over the next 100 years, it changed hands multiple times and also operated as the Wash Allen Bathhouse, the Gamba Mineral Springs, the Glenwood Health Spa, the Fort Defiance Bathhouse and the Iron Springs Spa. It was razed in 1996 to make way for a water park project that never came to fruition and sat vacant until construction of the Iron Mountain Hot Springs started in late 2014. A viewing tower reminiscent of one located on the site in the early 1900s is planned to reflect the site’s history. Richard Nash of Nash Construction was the general contractor for the Iron Mountain project, which involved approximately 50 contractors, vendors and suppliers from the Western Slope. The design is meant to ensure accessibility. A curving ramp with a handrail provides a gradual entrance to the family pool for those in wheelchairs or anyone who prefers to avoid steps. Two of the soaking pools have transfer walls and grab bars that allow a person to leave a mobility device and transfer onto the wall and then into the water. An aquatic wheelchair is available, and the family changing rooms are accessible as well. The springs features a lodge-style bathhouse. Separate changing rooms for families are available to make visits with the kids easier. A retail shop will offer swimwear, sunscreen and pool accessories, among other items. The facility includes the Sopris Café located next to the family pool. Free water and bottle-filling stations are available near the family changing rooms in the bathhouse.